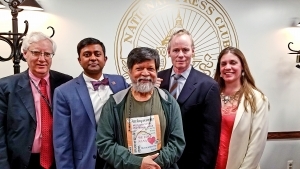 The government of Bangladesh has created a “climate of fear” for reporters and concerned citizens, a renowned Bangladeshi photojournalist told a National Press Club audience Thursday. Alam has earned international fame for his own bravery in the face of brutal conditions. He was named a Time magazine “person of the year” in 2018. Bangladeshi authorities imprisoned Alam last August and he remained in jail for more than 100 days. He was beaten in captivity, he said. The authorities have charged him with incitement to violence and trying to overthrow the government, Alam said -- charges that he and independent observers have called unfounded. At the Club event, sponsored by the Press Freedom team, Alam said his focus in captivity was remaining alive. “Dead martyrs don’t do good reporting,” he said. After a global outcry last year, Alam was released on bail in November. But he faces a new hearing on Monday and, if convicted, the prospect of a sentence of up to 14 years. Alam was jailed after he was interviewed on Al Jazeera television about a student protest of unsafe traffic conditions in Bangladesh. The demonstration turned into a violent clash after government-paid thugs attacked protesters, he told Al Jazeera. “Rather than embracing the students for what they’d done, the state turned its forces on them,” he told the Club audience. Outspoken and articulate Alam, 64, has had other run-ins with Bangladeshi authorities over his work and his support for social justice. Alam has worked not only as a photojournalist but also as an activist, artist and teacher of young Bangladeshi photographers at an institute that he set up. Nineteen journalists have been killed in Bangladesh as a result of their work since 1992, and in 15 of those cases, the murderers have gone unpunished, according to the Committee to Protect Journalists. Bangladesh’s jails contain many citizen journalists and activists -- even people who were apprehended because they “liked” something on Alam’s Facebook page, he said. Asked if he had given any thought to seeking asylum in the United States, Alam dismissed the idea and said he is committed to his country despite its troubles and his personal tribulations. Ferdous Al-Faruque, vice chairman of the Club's Board of Governors, moderated the discussion with Alam. "We are hoping the government of Bangladesh will reconsider its position on press freedom," Al-Faruque said, "because that is the cornerstone of any democracy."